I'm feeling confused - but I guess many of us are because it just is confusing after awhile with all the various incarnations this band has been through! They're talking about this new combination with Mike and Neil as if it's a new entity, 'a brand new band', and saying that the new members are not just temporary replacements on the road, even if it's all in the initial stages right now. I'm not a big Heartbreakers fan so I don't know much about Mike Campbell, but obviously he's had his own very illustrious career, as has Neil Finn - whose career I started following in the 1980s. He's a 'legend' in his own right in Oceania as a singer/songwriter, with a notable catalogue. He brings with him a long list of his own credentials. Feeling very torn atm because I respect both Lindsey and Neil as musicians and music creators, in their own right. It feels wrong to me to pit them against each other, or try to judge between them because they're both so worthy on their own terms. As was Peter Green. I can't even go there. Just a shame that there's bad feeling over this, which isn't very auspicious for the newcomers. The band are trying to tone it down as being a scheduling conflict, though many of the fans obviously think there's more to it. I honestly don't think however that Neil Finn would support unfair treatment of another great artist. He believes in his craft, and has had enough success of his own that he doesn't need to do anything for money. Nor does he seem the type who would do something just for fanfare or financial reward. Not trying to prove any point here! Just my own mixed feelings and emotions about everything atm. Sorry if I'm rambling ... take care everyone. It's a shame that there's such bad feelings here and this forum community can't enjoy discussions and anticipating a tour as in years past (at least distant past...I was more of a Ledge poster back during The Dance and SYW Tours)...but I think the bad feeling is much more obvious here in this little fishbowl. I think the the public at large, if they care at all and pay attention to even know Lindsey is gone, there's been more of a "oh, that's too bad was hoping to see them all together" to a "crazy old band still crazy" reaction. People moved on and will buy tickets or won't. I expect the tour to still do well and I expect to still go and have a great time. As for the newcomers, I've always enjoyed TP and the Heartbreakers and love Mike Campbell. In addition to his work with Tom Petty and with Stevie, he's also worked with Don Henley writing my two favorite solo Henley songs. I'm glad he's got something to do now that Tom's gone and I'm really excited to see him this tour. I'm far less familiar with Neil Finn. Outside of Don't Dream It's Over I'm unfamiliar with his work. I really like his voice, though, and given the recent live footage of Don't Dream It's Over shown on the CBS interview it sounds like his voice is in great shape; I'm looking forward to hearing more from him and seeing how the harmonies turn out on the upcoming FM tour. I appreciate your (and others) sharing more info on Neil for those like me who aren't very familiar with his work. It's kind of like going to a party and no one's there. All the fun and excitement is happening somewhere else. We'll see. Besides relief is for pussies! That's how I feel - if they had insisted Lindsey stayed, I think she still would've gone with them. In her solo career, she gets to do what she wants. Then when she returns to FM, she's amenable to what the majority want to do. Honestly, if it were Stevie or Christine departing, I wouldn't be getting as worked up as some others are about this happening. Or think it was end of the world. Ty - this weekend I think I'm gonna do a crash course in Mike Campbell! He writes clever lyrics with very catchy hooks. Many would say he's in the top five best songwriters from this part of the world, of all time. I certainly would. He just did a show with Mike Campbell joining for a try at 'Man Of The World'. Reviews have been very positive but we're unlikely to see footage because apparently recording is strictly not allowed at the venue. I guarantee that once there is some actual tangible activity from this band, and by that I mean something that isn’t a news show to announce they fired Lindsey. The first concert taking place for sure will make a difference but even just one good TV performance will change many minds (not all but many) and any sort of even remotely concrete recording news will turn the vibes around immediately. Neil Finn already said today on Sirius that he thinks the band will record new music. Yes that would be a good move, once the musicians get a bit used to each other. There would be more confidence in this lineup. If things go okay, I can definitely see a creative collaboration coming out of it. It will probably be more of a true 'team effort' than anything else FM has done in a long time. I think Neil's voice will blend in well with both Christine and Stevie. Last edited by Missy : 05-05-2018 at 11:29 PM. 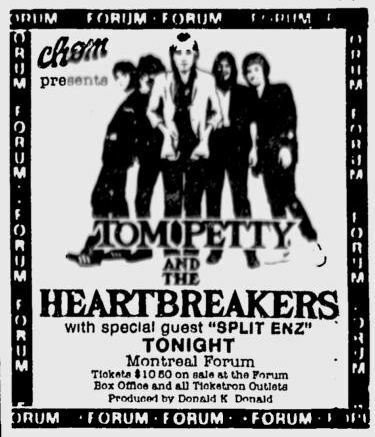 Don't know if this has been mentioned previously - Neil's first group Split Enz toured with Tom Petty in 1981. Apparently Tom Petty was a fan of the group. Stevie Nicks was also on that tour sometimes, and Neil recalled her being present, though doesn't sound like they all hung out together much. Neil and Mike also both helped write songs for the Dixie Chicks album 'Taking The Long Way'. You learn something new every day huh? Missy, thanks for the info- what a small world that the Heartbreakers toured with Split Enz back in the day! And now Mike and Neil are in Fleetwood Mac. I appreciate your sense of humor. That was the spirit of my post. Neil Finn already said today on Sirius that he thinks the band will record new music. I could see having Mike in the band motivating Stevie to do another album, but I thought the same thing when Christine came back. Christine and Neil seem to be on the same wavelength, and I would’nt be surprised if they had some type of collaboration, be it Fleetwood Mac or elsewhere. Been a long time since Stevie and Chris worked together and they don't have the greatest musical communication. I think Lindsey had to explain things to everyone else. But Stevie apparently has good rapport with Mike, who she knows quite well. With Neil, he and Stevie both have in common a love of the Everly Brothers at least! and should enjoy duetting. Mick and Neil are already friends. Christine had never met him. But I think their personalities and style will fit. And working with Lindsey probably helped break her into being back in a studio.